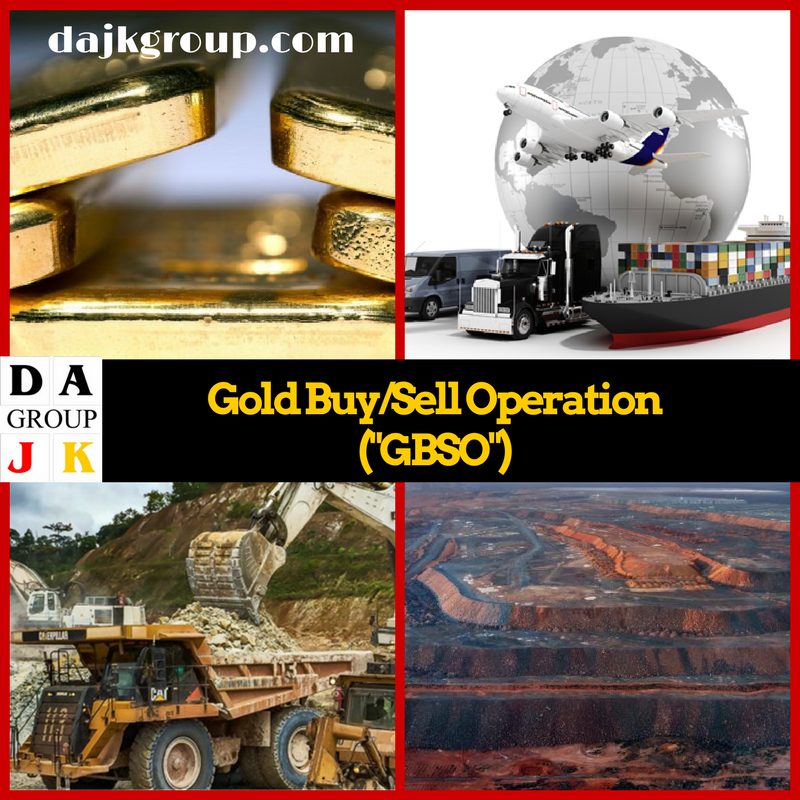 Step #1: DAJK is the principal on both the Buy and Sell gold Contracts. 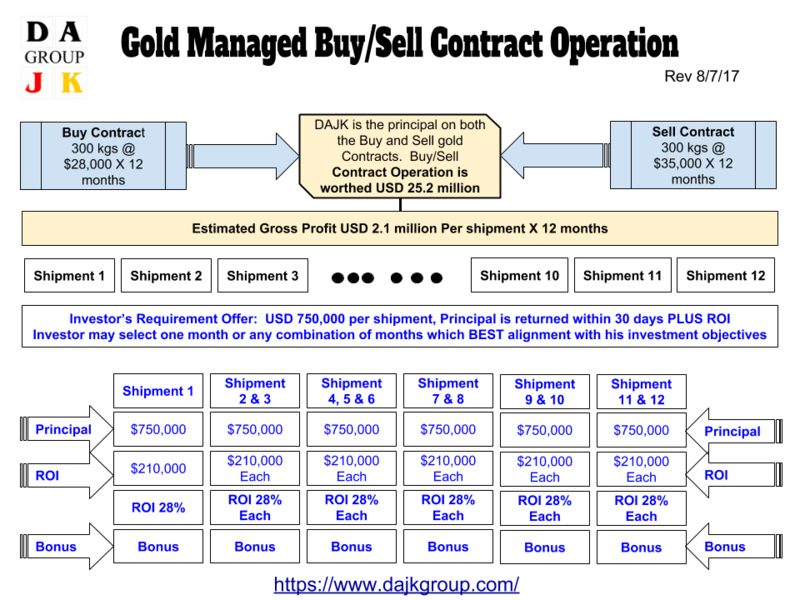 DAJK will source, negotiate, perform risk analysis, due diligence, verify, authenticate, paying for all required documents with local government agencies and logistic such as arrange customs clearance, air freight forwarding, fire essay at the designated refinery, and collect/disburse payments to all principals & intermediaries. 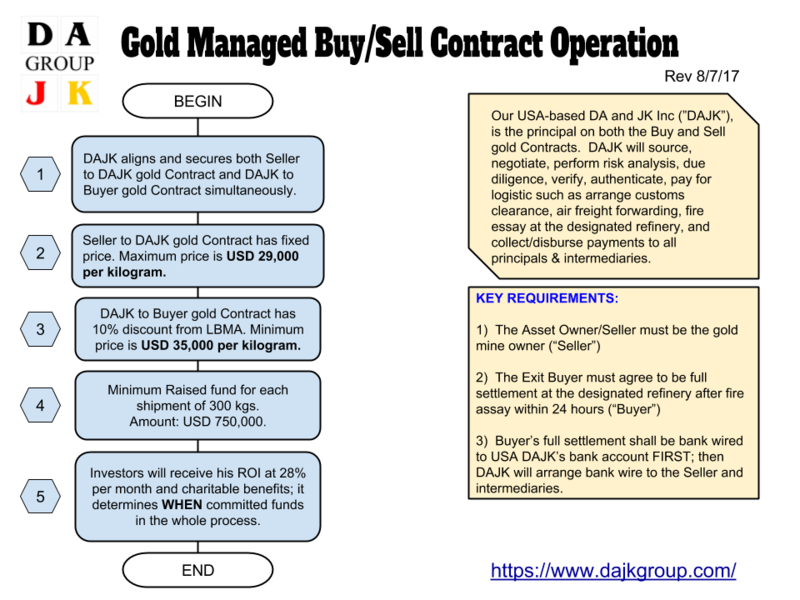 Step #2: DAJK will research, source, negotiate, perform risk analysis, due diligence, verify, and authenticate the Asset Owner/Seller ("Seller") rigorously and thoroughly. Once is completed, the Memorandum of Agreement shall be drafted between DAJK and the Seller. Finally, the Sales and Purchase Agreement ("SPA") shall be drafted and executed between both DAJK and the Seller. The maximum price is USD 29,000 per kilogram. Step #3: DAJK will research, source, negotiate, perform risk analysis, due diligence, verify, and authenticate the Exit Buyer ("Buyer") rigorously and thoroughly. Once is completed, the Memorandum of Agreement shall be drafted between DAJK and the Buyer. Finally, the Sales and Purchase Agreement ("SPA") shall be drafted and executed between both DAJK and the Buyer. The minimum price is USD 35,000 per kilogram. Step #4: DAJK will raise funds from investors paying for the final verification, inspection, government royalty tax, insurance, customs clearance and logistic arrangement from Seller location to Buyer's designated refinery. Generally, the minimum raised funds for monthly shipment of 300 kgs is USD 750,000. Step #5: Investors will receive a return on his investment is 28% per month and a charitable benefit, a net lease CRE business from DAJK through the investor's firm, or a credit to your acquisition one of the limited edition bronze sculptures "A sporting Chance for Peace"; it determines WHEN committed funds in the whole process. The investor can participate one month up to 11 months. Pay for Pro-Forma Invoice government taxes, title transfer, customs clearance, air freight forwarding, and insurance...etc. 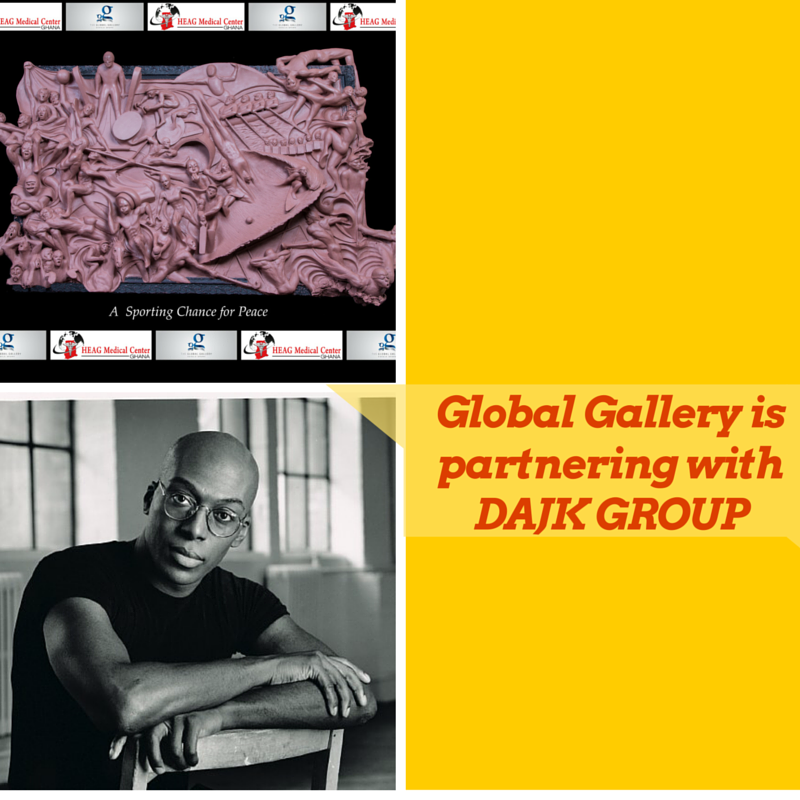 One-time Contribution to Your Purchase of Limited Edition bronze sculpture "A Sporting Chance for Peace": (from USD 100,000 to 200,000): In additional, DAJK will allocate some profits from this gold contract to credit to your purchase of a limited edition bronze sculpture "A Sporting Chance for Peace". 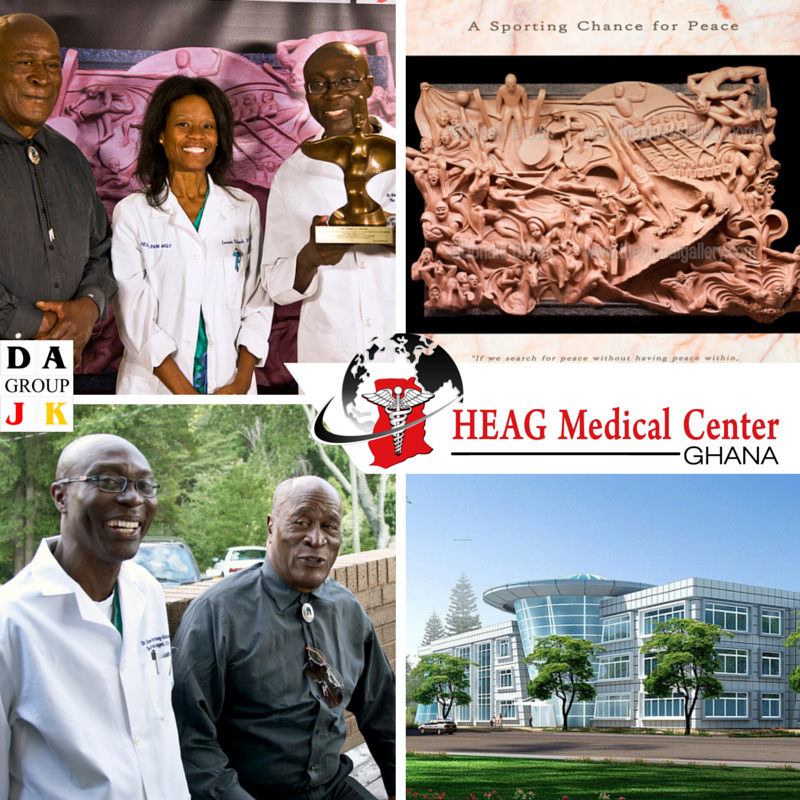 Should you have further questions or concerns, please contact us.